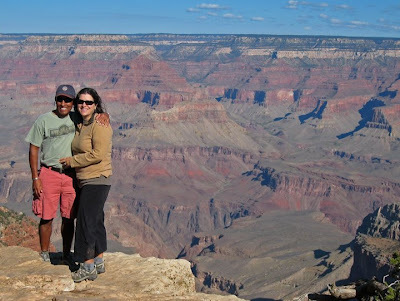 Diary of an Aspiring Loser: What do the Grand Canyon and a Baby Have in Common? 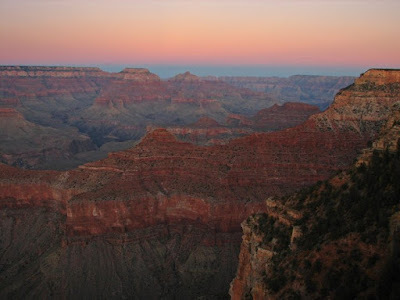 What do the Grand Canyon and a Baby Have in Common? You'll see pictures of both in this post!! It's getting harder and harder to fit things in. And the baby is still months away! It's true I have been up to a lot lately. One of which is feeling the baby kick! It was very surreal at first, and I was sort of in denial that that's what I was feeling but now it's pretty clear. Still, the idea that this is going to result in a human being still blows my mind. The trip to Arizona was great! This entry is going to be very picture intensive! And I'm sparing you the vast majority of the hundreds we took! 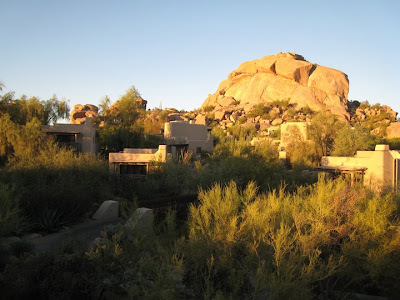 So we arrived and stayed at The Boulders, just outside of Scottsdale, for the first few days. Our time here was all about relaxing. Unfortunately I didn't make it into the fitness center once. Well, that's not true, I did peek in just to see what it looked like, but no workouts. The grounds, our room, the spa...it was all heaven. This is an early morning picture from our balcony. And here I am enjoying the spa pool. Best thing about the spa. No kids. I know, soon I will be one of those parents doting around a loud little one, but for now, I'm enjoying the peace and quiet. 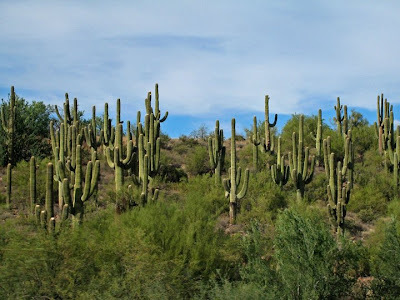 Lots of cacti in Arizona and they are so cool! Here's Miguel next to an old bugger. 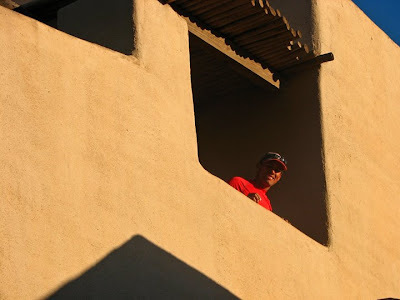 And here he is looking out the window by the front door to our "casita". I just love that picture for some reason. 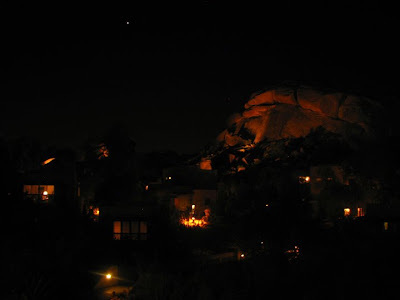 Next, we have a picture of the grounds at night. I got all fancy with our tripod for this one! We left The Boulders and started our road trip to The Grand Canyon. On the way I got to see lots of cacti. Here's a shot from our car. We stayed in Williams, a little town about an hour outside of the park. It really was a cute little town...really little. I can't imagine what it must be like to grow up in a small town like that with little diversity where everyone probably knows everyone and the whole place closes down by 8pm. 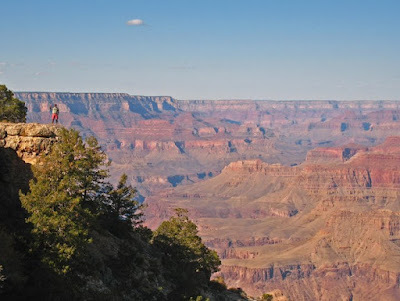 Okay, are you ready for a ton of Grand Canyon pictures? What can one say about it? It is appropriately named that's for sure. I just stood there in awe of the size that I know I wasn't really grasping. It's just too big for words, or for pictures, but we try. Here I am trying to take it all in. The weather couldn't have been more perfect. The morning started out with a chill in the air and it never really got "hot" all day. Lovely blue skies. Can you spot Miguel in this shot? Are they all starting to look the same yet? As the day went on the canyon became more and more orange. And as the sun sets the the sky starts changing colors...purple, pink, blue. Beautiful. We were not disappointed at the beauty and the grandeur of it all. And Miguel even spotted a California Condor! It was sleeping on the side of a cliff. So cool. 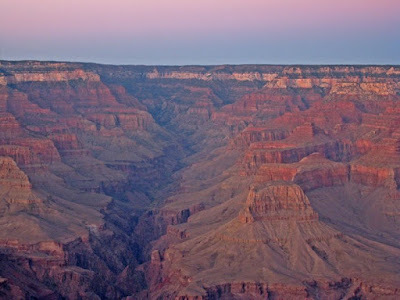 Alright, one last shot of the grand canyon at sunset. After the grand canyon we headed back to the Phoenix area. 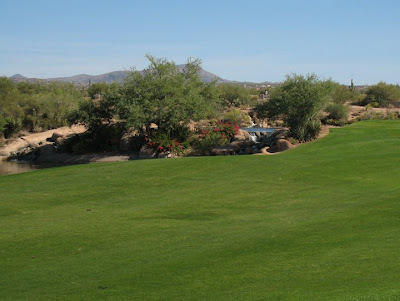 As far as we could tell things to do in Phoenix include sunbathing, shopping, dining and golf. We did our fair share of all of those things but I wanted to do something different too. 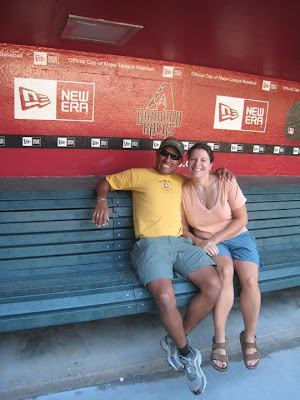 So we thought a tour of Chase Field, where the Diamondbacks play, might be cool. Here we are in the dugout. We're baseball fans and had a good time checking out the locker rooms and such. Our last couple of days there I spent...you guessed it, lying by the pool reading my book while Miguel golfed. As our vacation was wrapping up I was ready to come home. I'm not that into shopping, or golf, and I can only get so tan and eat so much. Come Friday I was happy to be home. So, what's inside my growing tummy? 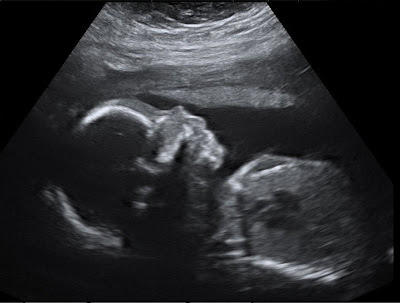 I had my 20 week ultrasound today. I'm happy to report the little guy is growing right on target. His heart, spine, and all other little parts are totally normal. Normal sounds just perfect. Can you see his little heart there? My mom and Miguel were there. This is the last time we get to see him until he's born. I'm excited to see him!! Last but not least...the weight. It's going ok. Well, not good really. I've gained at the rate an underweight woman should be gaining. Soon I'll be off the charts altogether. I could be doing a lot better. I'm still going to my swimming class twice a week and trying to keep my food choices within the sane realm but I need to be doing more. I don't know what's going to change things but for now I'm just doing what I can. I weigh about 175 right now. That's an 11 pound gain since I got pregnant at 164 pounds. I'll be happy to go back to Weight Watchers after the little guy comes. Nursing Points here I come!! I'm halfway there...20 weeks down, 20 to go. I can't believe we're having a baby!! How fun, Michelle! Thanks for all the pics. I really loved them. Your babykins looks so cute. I can't wait to see him either. I'm glad you can feel him..that makes it so much more real. And the belly is growing, but you look skinny still. So glad you got this rest before starting the new job. If you can call running an Oly distance tri run a rest. Congrats on that! Awww what a great post. I'm glad everything is going well with the pregnancy... and 11 pounds? Psha... I was just thinking how small you looked for being that far along. 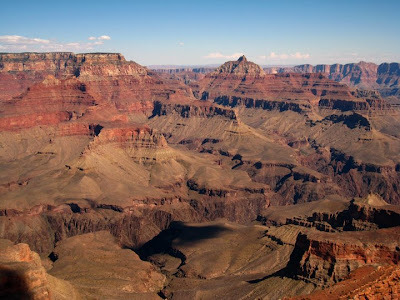 PS Some great photos of the Grand Canyon... 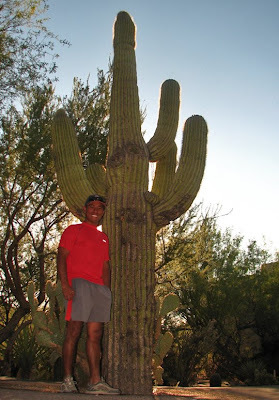 I've never been before and I've NEVER seen a real cactus! Awesome, awesome pix...what stamina you have to upload them all on Blogger...that must have taken HOURS! You look fabulous. Don't fret about the weight, just stay healthy and happy...Nursing afterwards does WONDERS for weight loss. Wow, sounds like a great time and pics are awesome!! I'm seriously impressed with you running in that triathlon!! You rock!!! YOU LOOK AWESOME!! And look how big the bean has gotten!!! You have a baby in that belly, how freaking cute. LOVE your pix. Now I sooo want to go to the GC. Those pix are like postcards. WOW beautiful photos and the Mommy to be is glowing.. You look wonderful!! I was waiting with baited breath to see how your pregnant tri experience went as I have now done my first and about to my second tri and I think I might be hooked. I was hoping it was do-able to keep doing it while pregnant as I'm sure I;ll be in that predicament in another year or so! Looks like you did a fantastic job, well done! I second all the other comments that you look fab! Those pics are gorgeous! Good job on the tri and doing the run and sticking to what is healthy for you!! I think you look amazing and all the weight seems to just be on your belly!! The trip sounded relaxing and a perfect break. I have never been to AZ, so thanks for the pics...it looks beautiful. Congrats on completing another Tri! You look amazing and your passion is such an inspiration. Gorgeous pictures! Gorgeous Mommy! You look fabulous and so healthy. What a nice trip you had! Congrats on the Tri too! I can't believe you're half way through already! You're doing fine with your weight...and you are still so fit and that makes all the difference! Wow! Those pictures are phenomenal! What a beautiful trip! And congrats on your relay run! Awesome job mama! You look GREAT in the pictures. I love races that are trying to be more green. I want one of those Kanteens! 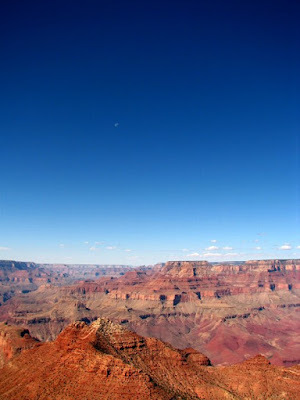 And I want to vacation at the Grand Canyon now...you really did the place proud with your pictures. Where to start??? You've been busy! The AZ trip looks glorious! 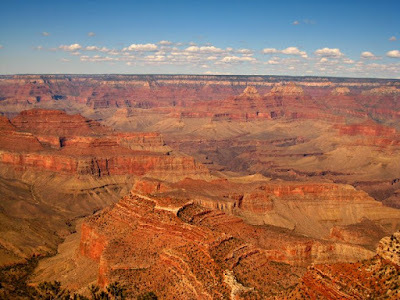 It's like a little bit of heaven, especially the Grand Canyon. The photos are spectacular. Congrats on the combined effort on the Tri! I really like that more events are going green. Those water bottles are great. That's going on my Christmas wish list at work. I'm very happy to hear that you are doing so well and the baby is growing and progressing! You've been so conscientious about how you're eating, plus staying active. It really does make things easier (once you have the baby) to get back in shape. Really. Great pics. 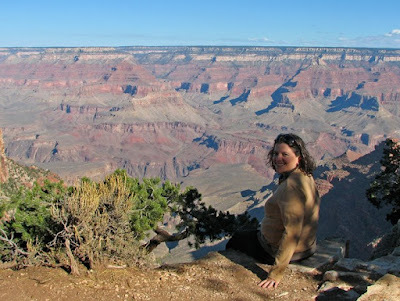 I did the Grand Canyon thing 2 summers ago and was awestruck. Are you guys really as close to the edge as you appear to be? If so you are a LOT braver than I was! Look at you Michelle! You look beautiful! 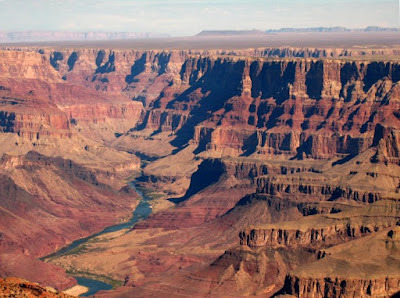 The photos of the Grand Canyon aren't bad either (ha ha). Looks like you had a great time and contgrats on finishing another tri. 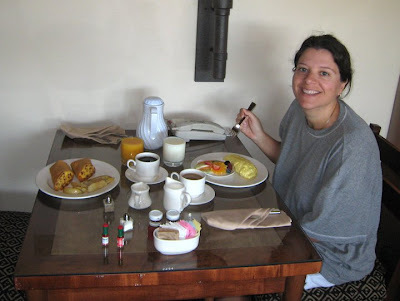 Well, I haven't been to your blog in quite a while and I have to tell you I just loved this one. Congratulations on the baby. The pictures were great and I am very happy for you. Looks like life has dealt you a winning hand. Hugs. Beautiful pictures! Can feel your happiness coming right off the page! aww how great! your pics are beautiful and you look so happy! You are amazing! To do that run, the bike ride, and all while pregnant. It sounds like you're doing awesome and shouldn't worry at all about your weight gain. By the way, the spa trip sounds heavenly. So jealous! isn't the boulders fabulous! 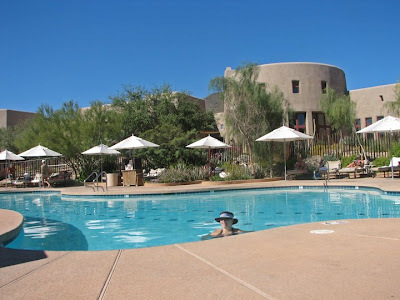 i lived in phoenix for two years and loved every minute of it. I knew I should have done this race! Congrats on the sonigram!